- The Cyclecizer exercise bike upright lets you adjust the difficulty using its 8 preset resistance levels. - This is one of the easiest exercise bikes for seniors on the market to adjust to perfectly fit your body type. Easily adjust the weighted and counterbalanced pedals to securely hold your feet. The extremely comfortable seat can be adjusted to fit most all body types to ensure a comfortable and safe workout. 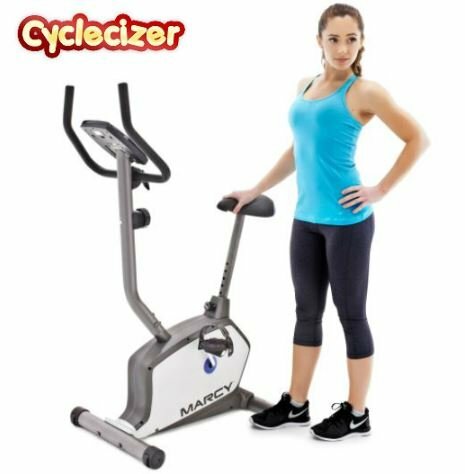 - The Cyclecizer exercise bikes stationary design makes it extremely sturdy even during your most rigorous workouts. While being very sturdy, it is still easy to transport and store anywhere in your home using the built in wheels. - There is no better way to start seeing results fast then by tracking your progress which is what makes the Cyclecizer one of the best exercise bike trainers out there. The easy to read monitor displays your time, speed, distance, pulse, calories burned, and monitors your heart rate giving you all the information you need to easily shed off those extra pounds. - This aerobic pedal exerciser gives you the best type of workout specifically designed to help easily lose weight. What are you waiting for? Get that body you always dreamed about! We have a no hassle 100% guarantee refund policy. If you use this and do not love it, simply return it for a full refund. You have nothing to lose. Consider picking up an extra one to be able to workout alongside your friends. SMOOTH AND NATURAL PERFORMANCE - This exercise bike for seniors delivers a very smooth performance with its 8 preset magnetic resistance levels. VERSATILE AND ADJUSTABLE - The weighted and counterbalanced pedals with adjustable straps along with an adjustable padded seat make this the perfect exercise bike upright and all body types. PORTABLE AND STURDY - With this exercise bikes stationary yet portable design you can easily transfer it from storage to any room in your home using its built in travel wheels . TRACK YOUR PROGRESS - Easy to read monitor displays time, speed, distance, pulse, calories burned, and monitors your heart rate to let you easily track your progress on this amazing exercise bike trainer. GUARANTEE - We want you to love our products. If you are not 100% satisfied, simply return it for a full no hassle refund. You have no risk, simply add one to your cart now. If you have any questions about this product by Cyclecizer, contact us by completing and submitting the form below. If you are looking for a specif part number, please include it with your message.